I haven't seen the Minions movie, yet. It's on the list of things to do, but so are a lot of other things. Still, I can celebrate all things minion. I have help in that one of my friends, Meredith, is kind of minion obsessed. She contributed to my enjoyment with a box of goodies. So many goodies, most of which were at the dollar store. I use the minion cup for beverages while I'm at the computer. Right now, it has Coca-Cola in it. The tic tacs sit off to the right. I'm not sure if I want to open them. The hand wash is in the bathroom. It's apple banana scented and is heavy on the apple, but light on the banana smell. I don't know if I want to use the toothbrush. It's cute. I will use the toothpaste, once I've used up what I have now. And the mouthwash is, well, interesting. It's called "Bubble Fruit" flavor. 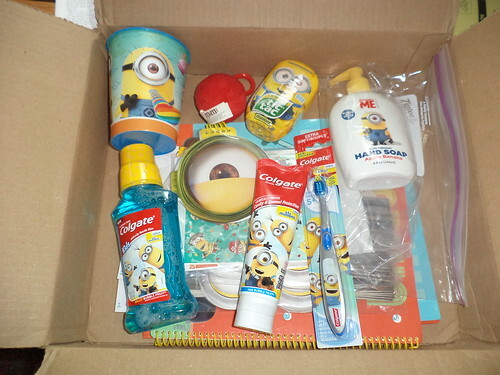 I had just used up some cinnamon flavor ACT mouthwash so I jumped in to use the minion branded one. Maybe if it had been dyed pink. I won't say it's horrible, but I won't rush right out and replace like for like when it's used up. Maybe it's my "adult" palate, but I thought the flavor was a bit too chemical and not fruity. Still, at a dollar for a bottle, it's a better value than the ACT brand I was using. There was going to be another Spectacular Death guild meet-up while I was in Virginia visiting Carole and Larry. With the movie out, it was the perfect time to do something of a minion theme. Meredith found minion paper goggles which we used for a guild photo. 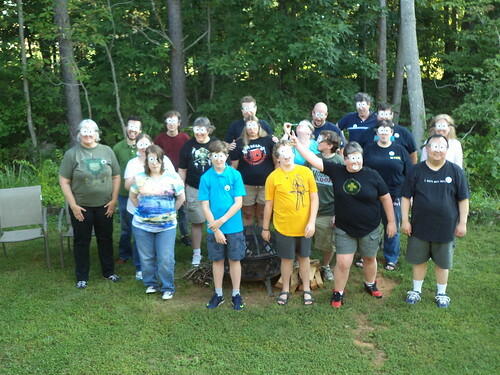 I'm grateful to the guild members who attended for going along with the goggles for a photo. 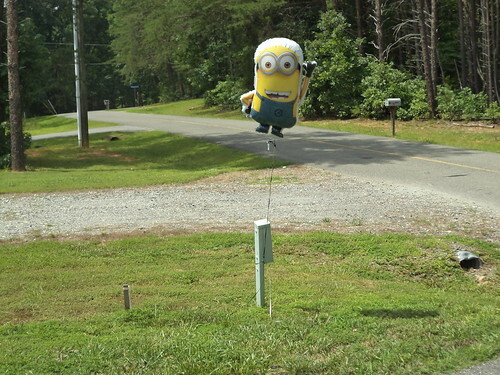 A minion balloon marked the driveway. 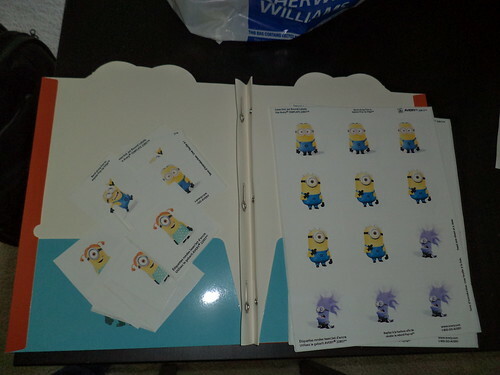 Meredith made name tags featuring minions and put them in a minion folder. I didn't have a printer or the time to make name badges. Next year, we probably won't need them because most everyone will know everyone else, but having minions was funny. 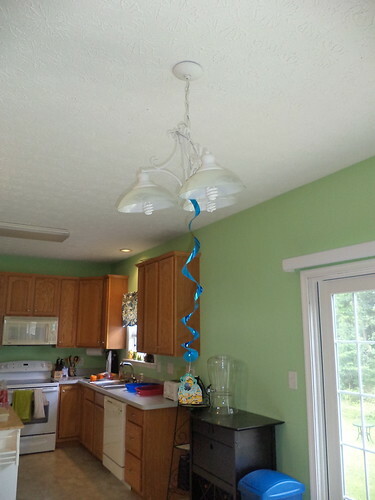 I bought a minion decorating package which contained spiral hangers and a banner. 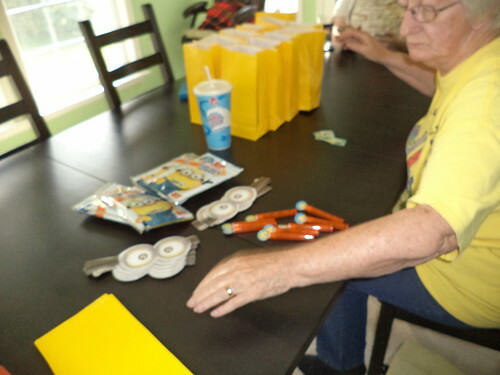 Everyone got a goodie bag containing a minion bubble wand, their goggles, a sticker and a minion activity book which contained crayons. Mom helped assemble the bags. The best minion item, however, is my poster. This is done at weddings. There is a poster or photo or something on which attendees can write messages of congratulations. I found this poster at AllPosters.com. Sadly, this doesn't seem to be available on their site anymore. I had each guild member, and Carole, pick a minion and sign their toon's name on it. I'm going to take this to JoAnn Fabrics next weekend, after I get paid, and have them frame it. I was trying to think, after making that decision, where I'd put this and suddenly it hit me. Of course, that's where it needs to go. You'll have to wait to see where that is, after it gets framed. We don't really NEED a theme for a guild party. The theme could be just "Spectacular Death gets together", but it was fun to assemble something totally silly. I can't thank Meredith enough for the goggles and the name tags. 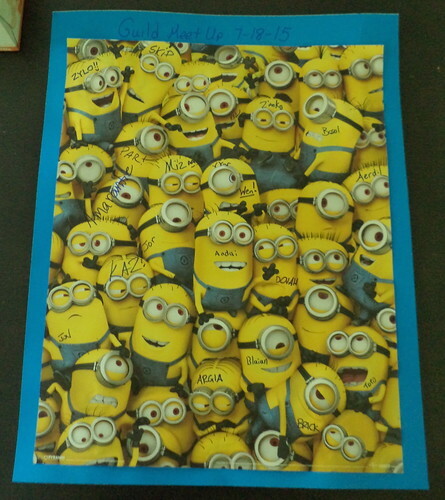 She also sent me a minion note book where I can record my thoughts about what crazy things my guild could get into. For the record, the red item in the box is an M&M zipper pull. It's gone onto my winter coat.